It was 7:30 when I woke up but I decided to go back to sleep. When I got up my clock said 10:00am. I went downstairs and didn’t find my host John Wojowski. I figured he was still sleeping. I got dressed and left the house. I hoped to find an adapter so I could use my computer. When I came to Europe this year I had plugs for Switzerland and Germany. It didn’t occur to me that England would have one completely different. I also realized I should change some more money. Since it was Sunday my intention was to take the train to the airport and change money there. I walked by the store that John had said should have an adapter and would open at 10:00. It was closed. I saw a clock and found it just past nine. I had forgotten that England and Europe were in different time zones. I am not sure how I did it, I must have been concentrating on something else, but I walked past the Oxford Road station and under the train tracks without noticing them. I kept walking, expecting to reach the station and finally came to a Starbucks. That was a sign. John told me he only drinks tea, and there was no coffee in the house. I did have the weekend Trib with me. I got coffee and found things in the paper I had not read. The most interesting article was about the play “Jerusalem” and the actor Mark Rylance. Mr. Rylance, who I had never heard of, was considered by many to be the greatest stage actor currently working. I also saw a notice for the art exhibition “Geographer”–The Golden Age of Dutch and Flemish Paintings. 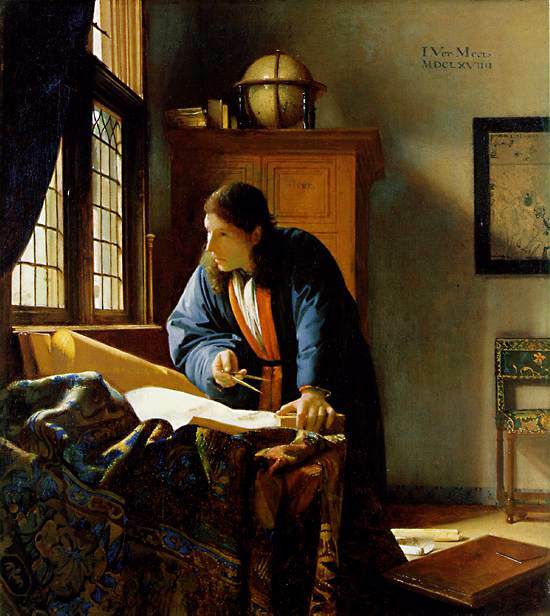 It would include 95 paintings starting with Vermeer’s “The Geographer” and show works by his predecessors and contemporaries, Rubens, Bruegel, Rembrandt and Hals. I wondered how I could get to Japan to see it. I made it back to the house without getting lost. I found John in the kitchen with a whole bunch of adapters One was the correct type. It would accept the German plug and would then go into a British socket. The only problem was it didn’t work. It had a fuse in it that was bad. Since most adapters are not fused John used tin foil to jump it. It worked fine after that. My assignment was then to create a poster for the Thursday show at Lass O’Gowrie. John said he was not a graphics artist. I told him I wasn’t either, but would do the job. 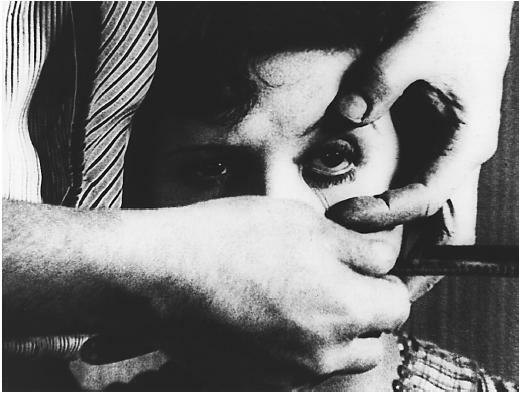 My idea was to use a shot of the woman just about to get her eyeball sliced in Un Chine Andalou and a still from the I Only Have Eyes Number from Dames. Then just the title of the show and the location and other details. John wanted more writing. I told him it was a poster, not a press release, so we did it my way. I hope it helps bring in a crowd. 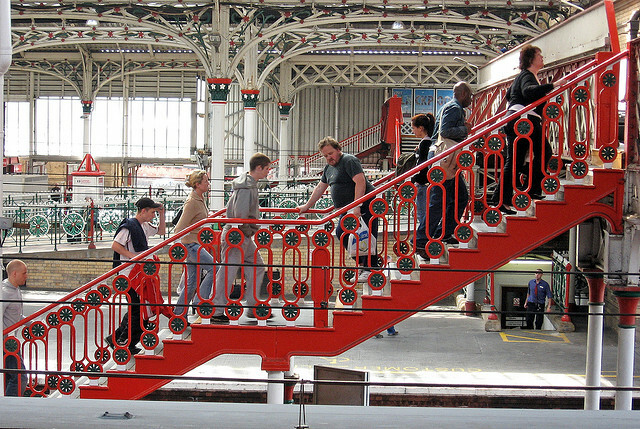 At two in the afternoon we walked to the train station and took the train to Preston. The train was the Manchester to Edinburgh express. It was packed, mostly with woman who probably had come to Manchester to shop. John and I stood the whole way during the hour long ride. 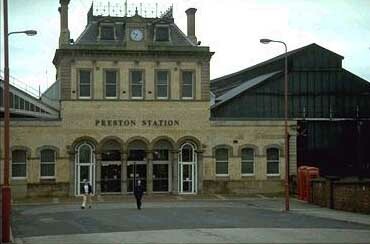 The Preston station was the oldest train station I have ever been in. It seemed easily Victorian and possibly even earlier. It really was cool and worth a trip to see. We walked to the Preston Uclan campus, that being University of Lancashire. I saw a sign to Blackburn. I said to John, isn’t Blackburn Lancashire mentioned in a Beattles song? I then recalled the lyric: Four thousand holes in Blackburn Lancashire. 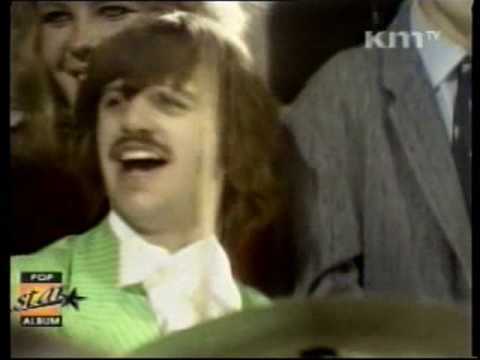 It is in the song A Day in the Life. I was in hallowed ground for a member of my generation, in a sort of trivial way. For some reason John couldn’t get directions on his I-phone so we had to ask directions. The show would be in the Media Building, one of the most modern buildings on the campus. There I found that my show was part of the LIFE Film Festival. That made it three film festival appearances on this trip. We were early so after checking in and getting badges we went into the cafe to wait. The first guy we met was Steve who would be providing the 16mm projector we would use. He was a tall young man with a mop of brown hair and small Van Dyke beard. The festival director Tony then came in. He was a compact but wide young man with black curly hair. He said we could have anything we wanted from the cafe. I had a sausage sandwich and a cafe au lait out of machine. The sandwich was very simple, sliced grilled sausages on a white bun with no mayo or anything else. Very tasty. We were taken to a media room upstairs to see the projector. It was an EIKI RT-O, a nice projector. John sat down and put his feet up. 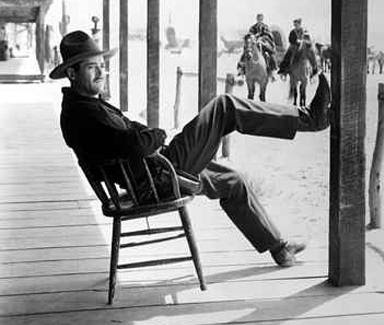 I told him he had accidentally struck the famous pose of Henry Fonda in the movie My Darling Clementine. We found that picture on line on his I-Phone. I then took a picture of him to match it. The only thing missing was a cowboy hat. In the Henry Fonda shot there are approaching men on horses in the background. In the background of our shot was the 16mm projector. Since I did have a hat, not quite a Stetson, we got a picture of me in the pose too. My show was in a room labeled Sound Stage. It had a big green screen in the back for shooting. The projector was set up in the back of the room. It had a fixed lens but with the long throw the size of the image was big enough. It also had a jammed open floating roller, which when closed keeps the sound stable. I was able to jam it closed after loading the film with an OK result. 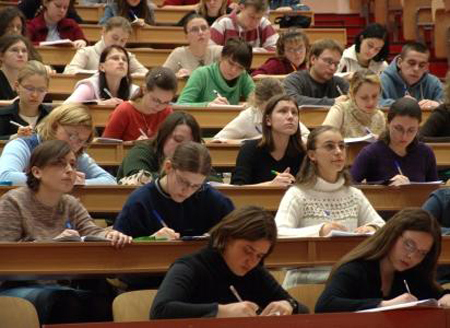 A crowd of around thirty, most of them college students, showed up to watch. After my opening remarks, which were lengthy due to them being college students, I went out in the hall to write. Next to the Sound Stage room was a dance room. I found a chair there. I took it to the closest electrical outlet in the hall to the Sound Stage room. I could hear my cartoons playing through the door. I was happily writing away when I noticed the sound abruptly stop during the cartoon The Clean Pastures (1937). Inside I found the lights up and the technician looking at the projector. The mechanism had stopped and when the film stopped, with the frame in the gate, the frame had melted from the middle outward. It looked cool on the screen. I told the students not to be concerned. It was in itself a thing of beauty, a once fairly common thing to see, that now was almost lost and would never be seen watching a DVD. I added that film runs at 24 frames per second and the melted frame would be left in and never noticed in future screening. The technician thought the film had jammed. I showed them the drive belt had broken. The belt looks like something commonly used in vacuum cleaners. While they went looking for something to use as a spare I took questions from the audience. Since we had plenty of time I could talk about just about anything. I told them about the invention of sound films beginning with W.K.L Dixon, the Kuchar Brothers, and the conversation at UCLA in the fall with the head of the Library of Congress where the death of 16mm had been discussed. John Wojowski saved the day. He took the belt out of the front arm, only used when re-winding, and used it for the drive belt. We were again in business. At the reel break I did not take questions. Instead I acted as projectionist and got the second reel on the screen. I then went back out in the hall to write. At the end of the show I took several questions from the audience. They were a good group. John and I then walked to Wobser’s house. Peter Wobser and I had worked together as part of the three man jury, the third juror was Kevin Burke, for the 2001 KinoFilm Festival. I had also stayed in his flat during that festival. It was a very nice place that took up the entire top floor of a small apartment building. He had since moved to Preston. Walking up a winding road to where it teed we saw Wobser out on the sidewalk on the other side waiting for us. We joined him. We then crossed a large vacant lot, deep enough for a house and wide enough for several, now a mess of weeds and remnants of broken foundations and stuff. It was now Wobser’s de facto backyard. His girl friend Krystal and a couple of guys were sitting on lawn chairs enjoying the fine day. We joined them. One guy was Kyle, who’s parents lived in Portland, Oregon. He had a cast on one leg that I forget to ask about. Instead we talked about the financial situation in Oregon and what a mess it was and how horribly it affected all the school kids except for those in the most affluent areas. The other guy was named Mark. He didn’t have much to say. They were all drinking vodka drinks that looked like Tom Collins. I had a Fosters Lager beer. Kristal had a whole bunch of blond hair and was from Ireland. She was a film maker. Wobser was also a film maker. He was from Germany and had first been trained as a sound editor who worked in dubbing foreign films into German. He was also trained as a cinematographer. He lectures on film making at Preston University. He soon disappeared into his house. It and its brethren had been built in 1843. Each one had a square projection sticking out of the second floor in the back. That was where the bathrooms had been added when indoor plumbing became the norm. The reason Wobser disappeared was that he was making dinner. He felt bad he hadn’t come to the film show and was giving us dinner as atonement. It was curry vegetables and also tandoor chicken. It was all very good although the curry was hotter than I like. That didn’t stop me from eating it all and enjoying it immensely. The four of us chatted until ten fifteen when Wobser rushed us through the dark streets to the station for the train trip home.